Soothing, refreshing action, gel formula, chamomile provides relief to irritated gums and it is safe to swallow and without flavor. The silicone finger toothbrush is a useful tool for the proper application of Chicco's gum gel, the soft bristles allow parents to safely massage reddened gums and baby's first teeth. 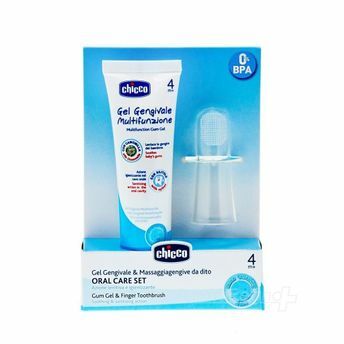 It includes Chicco finger toothbrush and gum gel, suitable for soothing discomfort linked to the eruption of baby's first teeth. It cleans and sanitizes the oral mucosa. Contains xylitol, known for its anti bacterial action.